The Pro-SL Self-Locking Tape from Lightning Powder is a compact and portable crime scene investigation tool. The 36 inch tape is marked in feet, inches and 16ths as well as metric measurements, making it easy to precisely measure and record distances. 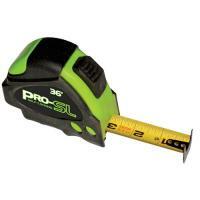 Vertical markings on the reverse side allow you to measure easily in any direction, making the tool more versatile. The tape includes top and bottom brake releases for ease of use in either orientation, and the double end hook is multi-riveted for durability. Its nylon coating helps to extend its lifespan and also prevents it from marking surfaces.